Voters in Montgomery County, Texas, rejected a road-building bond referendum. Despite local support for transit, county leaders plan to give the referendum another try. Suburban Houston won’t pave its way out of congestion. The Houston Chronicle reports that opposition to a $350 million bond measure, all of it for road construction, was led by residents of one affluent enclave who don’t want a traffic-inducing parkway extension. But there’s more to the story. Like virtually all U.S. metros, the Houston region has a broken transportation system that won’t be fixed by building more roads. Jay Blazek Crossley at Houston Tomorrow points out that nearly half of Montgomery County residents surveyed for a Rice University study wanted improvements to transit, while far fewer think road expansions are the way to go. “Fewer than one-third of the respondents in any of the counties (including Montgomery County) thought the best solution involves ‘building bigger and better roads and highways,’” writes Crossley. Yet it looks like local officials intend to bring the same referendum back to voters, only without the parkway project. Building new roads in unpopulated areas brings development, construction and road jobs, and a temporary period of free wheeling on those new roads. However, this scheme always inevitably fails as we have horribly seen across every part of the Houston region. Road bonds lead to road debt, ongoing maintenance costs, and growing vehicle miles traveled with which our local and state governments are not prepared to grapple. No American city has ever “reduced congestion.” No elected official in the Houston region has ever achieved this empty campaign promise. We are driving much more now as a population – even with the millennial preference for walking – and we don’t like it. Houstonians are spending too much on transportation, but we don’t have to waste our money. Unfortunately, Houston is leading the nation’s top ten metropolitan regions in spending per capita on roads. 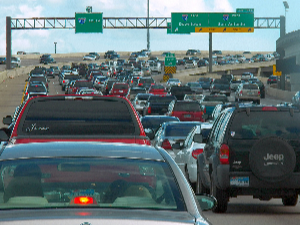 It takes longer to drive on the free lanes of I-10 West in rush hour now than before we expanded it to the widest road in the world, because of the expected effect of induced development. The failure of the Montgomery County sprawl subsidy bond should not be followed with more failure. Elsewhere on the Network: Cap’n Transit says that in 2015, major urban transit systems must focus on expanding capacity, not filling seats; and ATL Urbanist thinks a trail that will allow people to walk and bike through a monstrous new Atlanta interchange is welcome, but beside the point.